It has taken three golf course superintendents and multiple general managers, but Pasatiempo finally has the water it has been waiting so long for. The course in Santa Cruz, California, recently reached a deal with the nearby city of Scotts Valley and the Scotts Valley Water District that guarantees Pasatiempo no less than 35 million gallons of recycled water per year for 30 years. Construction is underway on infrastructure needed to store and pump the water. That work will be completed in about a year, said Pasatiempo superintendent Justin Mandon. That is welcome news at Pasatiempo, which until recently had been among some of the hardest-hit courses in California's well-chronicled drought. "Golf is supposed to be firm and fast. The problem was we had lost control of that," Mandon said. "The difference now is that we will have control over firm and fast." 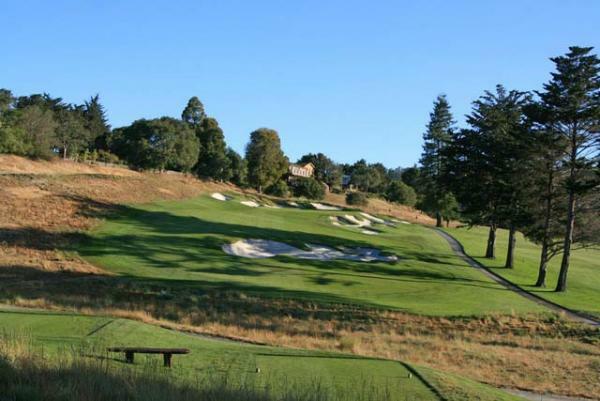 Pasatiempo is the cradle of Alister MacKenzie's designs in the United State. Although it's not his first U.S. undertaking - that title is reserved for the Meadow Club in Marin County - MacKenzie maintained a residence on the course located within sight of the northern end of Monterey Bay. In response to the drought, the City of Santa Cruz initiated cutbacks of 15 percent to 50 percent during the past two years, resulting in a lot of brown turf. Only recently, in early April, did the city remove restrictions, thanks to an El Nino winter that dropped 40-60 inches of rain on the western slope of the Santa Cruz Mountains. That was twice as much as San Jose received on the eastern side of the range, and it was enough to fill the Loch Lomond reservoir, from which the City of Santa Cruz draws much of its water. Negotiations over recycled water for Pasatiempo have been ongoing with officials in Scotts Valley at least since 2006 when Dean Gump still was the superintendent there. A lot of faces have changed since then, but one thing has remained constant - Pasatiempo's need for water, and there is hard evidence that the idea of running recycled water to the course is one that took hold nearly 40 years ago. Initially, Scotts Valley officials wanted to trade their dirty water for excess potable water owned by Santa Cruz. Those talks never really went anywhere. "That was the original plan," Mandon said. "Scotts Valley wanted to trade for freshwater, but Santa Cruz was never interested in that." The new deal is the result of a lot of hard work by parties on both sides, including Pasatiempo GM Scott Hoyt. The SVWD treatment plant is 2.5 miles from the golf course. A line that runs from the plant to the Pacific, where it dumps millions of gallons per year, comes within a block of Pasatiempo. A year ago, Mandon unearthed a metered pipe that runs from that line onto golf course property that was installed in 1979 or 1980, according to records. The meter still reads all 0's, but will be ready to go once an underground storage tank and pump station are built at the golf course. Pasatiempo paid the city of Scotts Valley and the SVWD a total of $1.6 million (that they divvy between them) for the rights to 35 million gallons per year for 30 years. "This is the biggest home run (the city and water district) have ever hit," Mandon said. "They don't do anything different. We just pull the water before it goes into the ocean and hand them the money." The water, which will enter the property as secondary treated water, will need an additional layer of filtration and chlorination to reach tertiary status. Mandon hasn't determined who that will be yet. But since the water is secondary treated, it won't require a licensed water professional. In fact, the State Water Resources Control Board provides a standard to maintain and is leaving it Mandon to find a way to reach it. "They are leaving it up to us. We have to show the test results daily," he said. "If it doesn't meet those standards, and alarm will sound and the system will shut itself down." The 35 million gallon annual allotment is just 15 percent of the water the SVWD is discharging through the line that runs past Pasatiempo. And since the golf course is the only customer for that recycled water, it will have access to the excess until other users come forward in the future. "Right now, it's all excess water," Mandon said. "There are no customers for it. "This is the easiest thing they've ever had to do."